These are small birds with long tails. 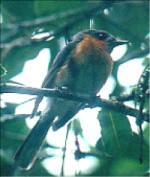 The Spectacled Monarch is a small gun-metal bluish grey and creamy-white bird with rufous breast. Its loud buzzing call is often heard in lowland rainforest, and they can be seen at Marrdja and in the forest behind Cape Tribulation.